Do you want to record a video of your desktop so that you can submit a bug report, create a video guide, or maybe even just record a quick video to help with a software problem a friend of yours may be having? Being able to record desktop screencasts can definitely be useful in many ways, but the first thing you’ll need is a capable screen recorder. Define the capture area by using the mouse cursor to draw a frame, choosing a preset in the ‘Capture Area’ list, or selecting a window on your desktop that you want to record. Select the audio source that you want to record by making sure the ‘System Audio’ or ‘Microphone’ icons are highlighted depending on whether you want to record audio from your speaker or a voiceover via a microphone (or both). Click ‘REC’ to start recording and ‘Stop’ when you are done. If you want to save the video immediately press ‘Save as’ or click on the ‘Open in Editor’ button if you would like to edit your video first. If you do choose to edit your video, Movavi Screen Capture Studio will place a ton of different features at your disposal to do so. 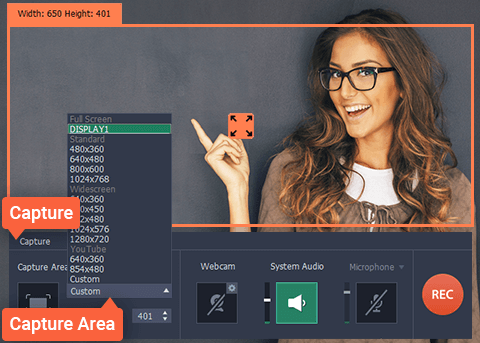 With the tools, it provides you could trim out unwanted video segments, merge clips together, improve the video quality, add background music, insert customizable captions, apply special effects or filters, fix common problems, and much more. The scope of the features that Movavi Screen Capture Studio provides will make certain that you have everything you need – regardless of whether you just want to tweak your video in a few simple ways, or transform it into a professional-looking piece of content. In short, you could get a lot done, and on your part it will just take a few minutes of your time to experiment and get a feel for the features and how they work.